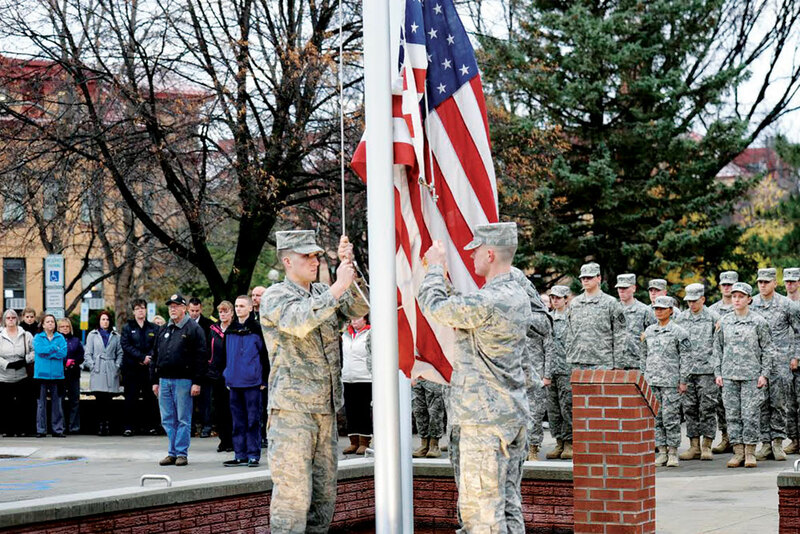 North Dakota State recognizes its service people Thursday with a flag raising and ceremony. 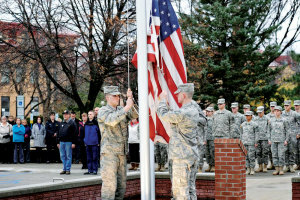 The North Dakota State Military and Veteran’s Services, in collaboration with the NDSU Equity and Diversity Center, held a flag raising ceremony followed by a veteran speaker in honor of Veteran’s Day. On Thursday morning outside the south entrance of the Memorial Union, an estimated 75 people gathered to honor Veteran’s Day, which is observed Tuesday. The event started with NDSU representative speakers who spoke of the importance of Veteran’s Day and honoring our Veteran’s as well as fallen soldiers. After the flag had risen, Mark Lindquist sung the National Anthem. Students walking to class took the time to stop where they were and placed their right hand over their heart. A roll call was taken, reading out the names of veterans present at the event as well as calling the names of fallen NDSU service members. The names of the fallen soldiers were called three times, symbolizing that the soldier was not present but still recognized as a part of the rank. Last year was the first year the flag raising ceremony took place. Post Commander Shelby Moen helped organize the event. She said the ceremony went smoother than last year. 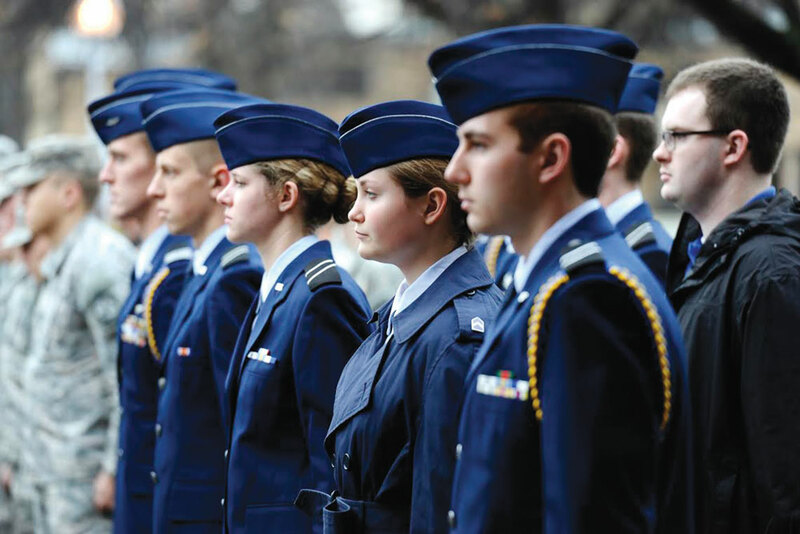 “Veteran’s Day is an important day for people to take the time to think about the sacrifices made and honor our veterans and their service,” Moen said. Following the ceremony people were invited to hear speaker Mark Lindquist, a veteran of the Afghanistan war and co-founder of Breath Is Limited Motivational Speaking and Entertainment, LLC. Lindquist spoke about his life dedication to service and volunteerism and the important role it played in forming his life. He encouraged people to find their passion as well as the importance of service and volunteering. Kaarin Remmich, coordinator for the NDSU Military and Veteran’s Services, said everyone should take the time to remember our veterans. 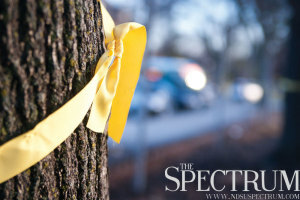 “We all need to pause and remember the service of our veterans,” Remmich said. NDSU student and Afghanistan veteran Chris Howell reflected on what Tuesday will mean to him. “Veteran’s Day is a day to reflect on veteran’s service to our country and what they’ve done but also, to me, to remember those who aren’t with us anymore,” he said.